This is another Christmas card design for Christmas 2018. 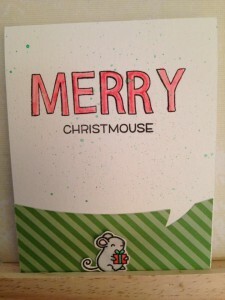 I used the same ideas from Merry Christmouse cards but added a few more details. 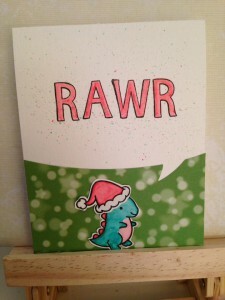 Extra Details: I began this card with a card base made from water color paper. 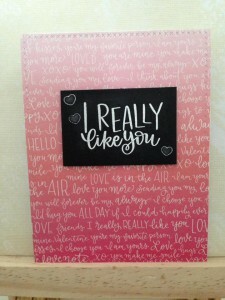 I stamped the sentiment on black ink on the card base. I used Distress Inks to water color the letters. I also added some splatters of red and green ink for interest. I die cut a scrap of patterned paper with a speech bubble border die. I adhered this to the bottom of the card base. 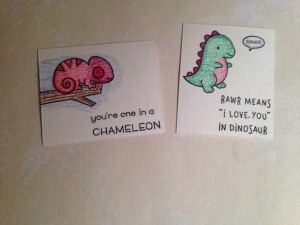 On a scrap of water color paper, I stamped and water colored the dinosaur and hat. I used Distress Inks to water color everything in. Once the ink was dry, I fussy cut everything out and adhered the images to the card front. 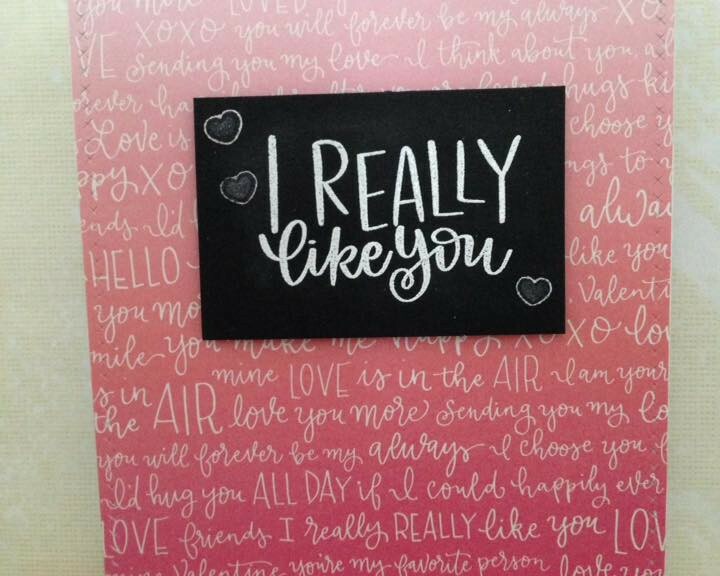 I used black ink to stamp the message on the inside of the card. I love the way the front and inside of this card are really connected. Hope you enjoyed the card! This is another Christmas card design for Christmas 2018. 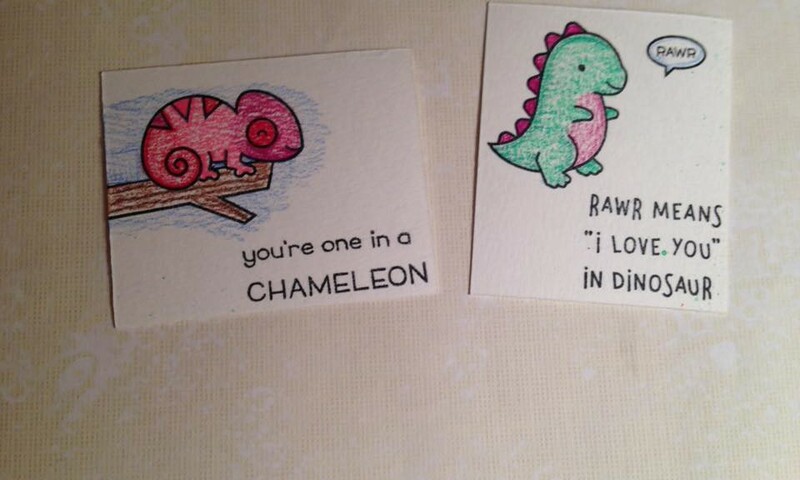 I love this card design; it’s so cute! On a scrap of water color paper, I stamped and water colored the little mouse. 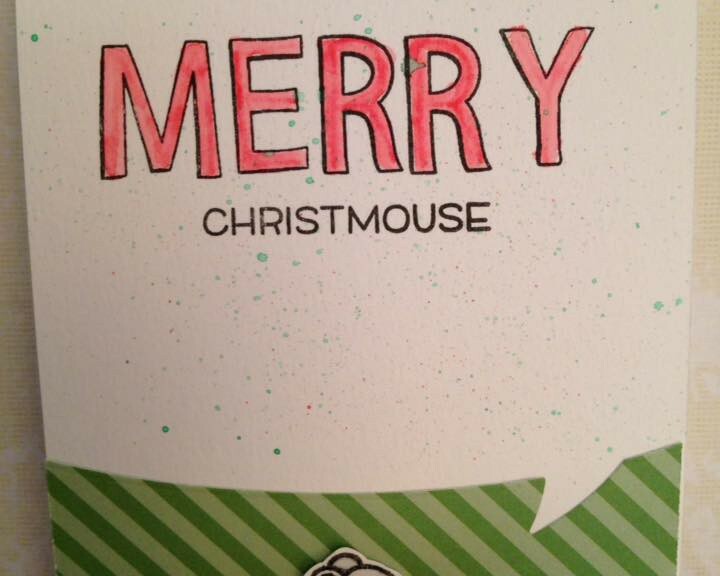 I used Distress Inks to water color the mouse also. Once the mouse was dry, I fussy cut him out and adhered him to the card base. This is another card I made from the Simon Says Stamp’s January 2018 Card Kit. I LOVE this kit and have made many cards with it. 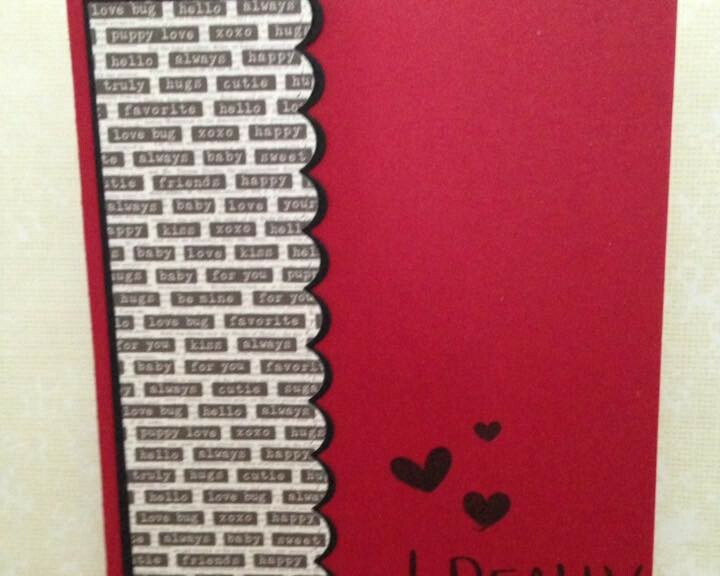 Extra Details: I began this card by covering a white card base with a panel of pink card stock. 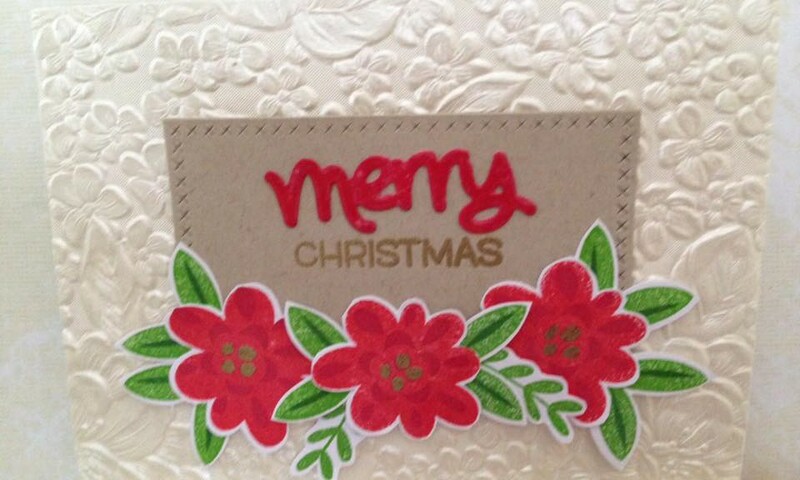 I cut the front flap of the card short so I could add a scalloped border of patterned paper. 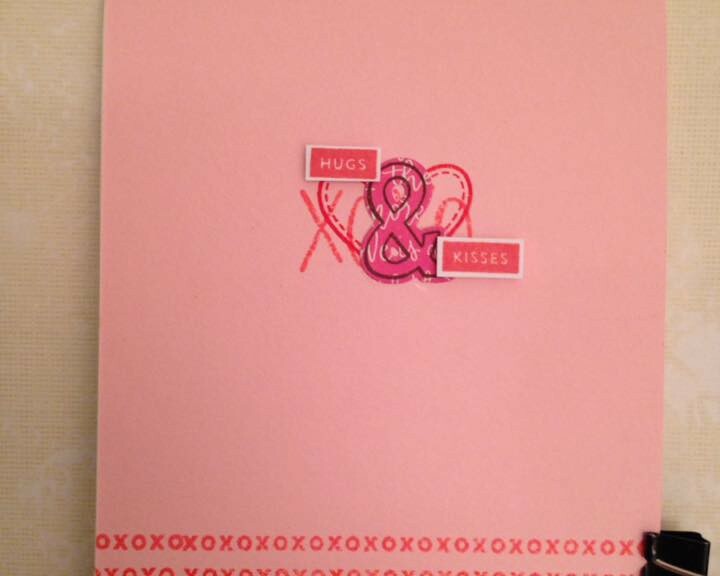 I stamped the xoxo border along the bottom of the pink card stock in two shades of pinkish ink. 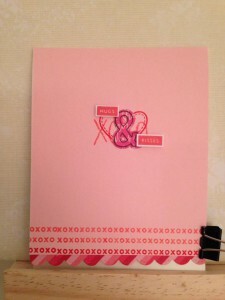 I also stamped the larger XOXO in one of the same inks. I added an outline heart. 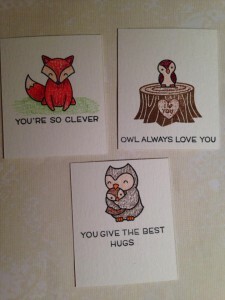 For the sentiment, I stamped and fussy cut the labels form the stamp set. I added an ampersand that I die cut from some patterned paper. To finish the card, I adhered the ampersand flat the card base and used foam tape on the labels. Extra Details: I began this card by covering a white card base with a panel of patterned paper that I had die cut with a crossed stitched rectangle. I also die cut a rectangle of black card stock. I heat embossed the sentiment in white. I added some hearts in a pink shimmer ink. Lastly, I adhered the black rectangle to the card base. 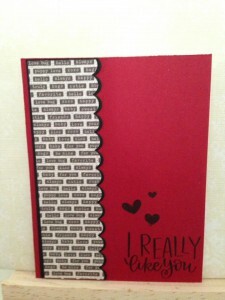 Extra Details: I began this card by covering a white card base with a panel of red card stock from the kit. I stamped the sentiment and hearts in black ink. I die cut a strip of patterned paper with a scalloped border die. I layered the patterned paper on some of the black card stock. I re-aligned the scalloped border die and cut the black card stock to match the patterned paper. Then I adhered the scalloped strips to the card front. I left a small sliver of red card stock on the left for interest. This is another card design for Christmas 2018. I loved watching all the YouTube videos featuring poinsettia stamps. I don’t any, so I stretched the stamps I did have. I also used the beautiful embossed paper from the Simon Says Stamp’s November 2017 Card Kit on this card. Extra Details: I began this card by adhered the embossed paper to a white card base. I used a crossed stitched rectangle die to die cut a small rectangle of kraft card stock. 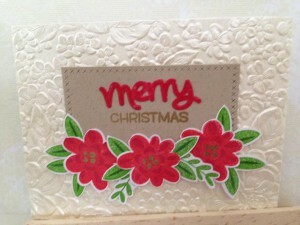 I added the word Christmas with Versa Mark Ink and gold embossing powder. Once the embossing was complete, I adhered the rectangle to the card base. I die cut the work merry from some red card stock. 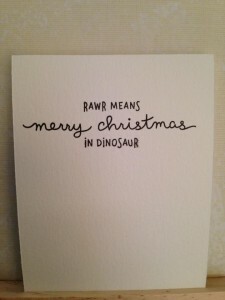 I adhered it above the word Christmas on the kraft rectangle. I covered it with Glossy Accents to give it a shiny finish. I stamped the flowers and leaves on some white card stock. I used a stamp layering set and two shades of red and green ink. I added the gold centers to the flowers with an embossing pen and the same gold embossing folder. Once the ink was set, I fussy cut everything out. I adhered the florals to the card front with glue dots and the card was finished. 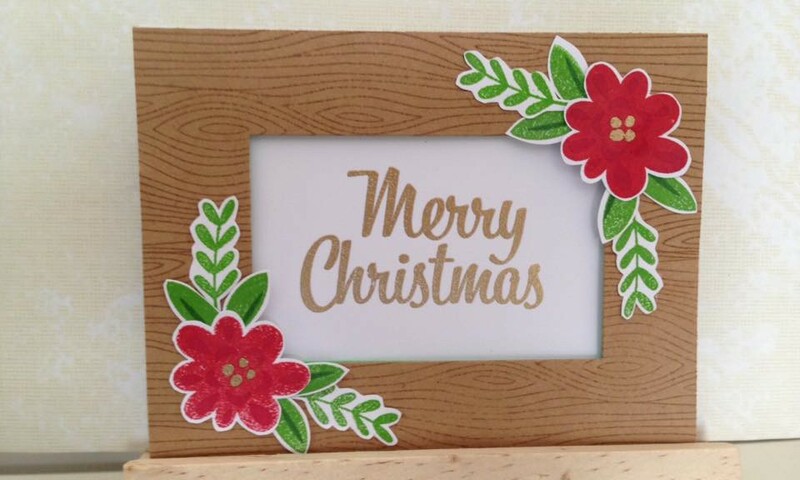 This is another card design for Christmas 2018. I loved watching all the YouTube videos featuring poinsettia stamps. I don’t any, so I stretched the stamps I did have. Extra Details: I began this card with a 4.25 x 5.5 inch panel of kraft paper. I stamped the paper with a wood grain stamp and some brown ink. I die cut a rectangle from the middle of the panel. Using the frame as a guide, I stamped the sentiment in Versa Mark ink and used gold embossing powder on it. 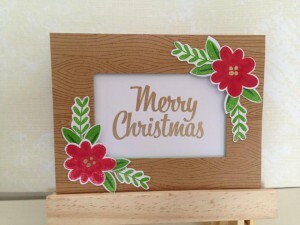 Once I finished the heat embossing, I adhere the frame to the card base with foam tape. I stamped the flowers and leaves on some white card stock. I used a color layering set and two shades of green and red inks. To add the gold centers to the flowers, I used an embossing pen and the same gold embossing powder. Once the florals were dry, I fussy cut everything out. I used glue dots to adhere the flowers to the card. I am finally getting back into the usual routine after the holidays. This card was inspired by three challenges this week. Extra Details: I began this card with a 4.25 x 5.5 inch panel of grey cardstock. I stamped the solid diamonds in white pigment ink all over the panel. Once the ink was dry, I stamped the quilted lines in a darker grey ink. I die cut a tag shape from some white card stock. 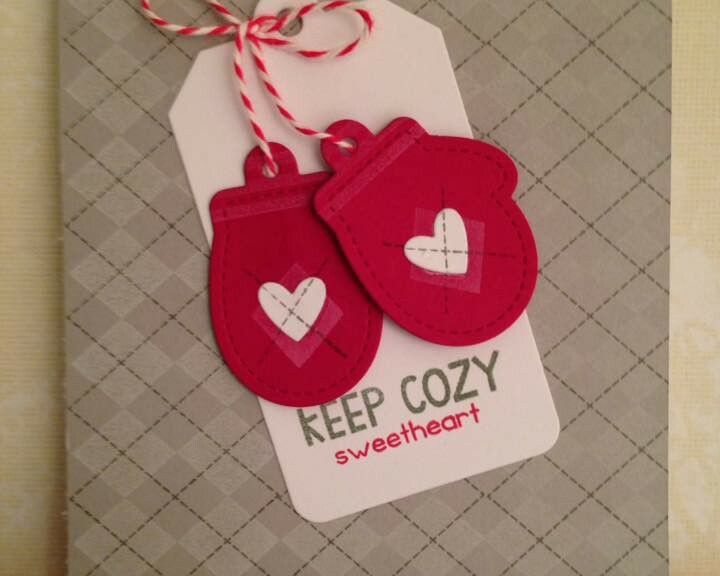 I added the sentiment to the white tag using the same darker grey ink and some red ink. I die cut the mittens from red card stock. I added some detail with the white and grey inks. As a finishing touch, I added a small white heart that I die cut. 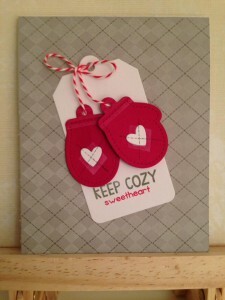 I used some red and white twine to add a bow to the top of the tag. I adhered the tails of the bow to the mittens using regular scotch tape. I adhered one bow flat to the tag and the other with some foam tape. Lastly, I added the tag to the grey panel and adhered everything to a white card base. This is the latest batch of Lunch Box Notes I created. 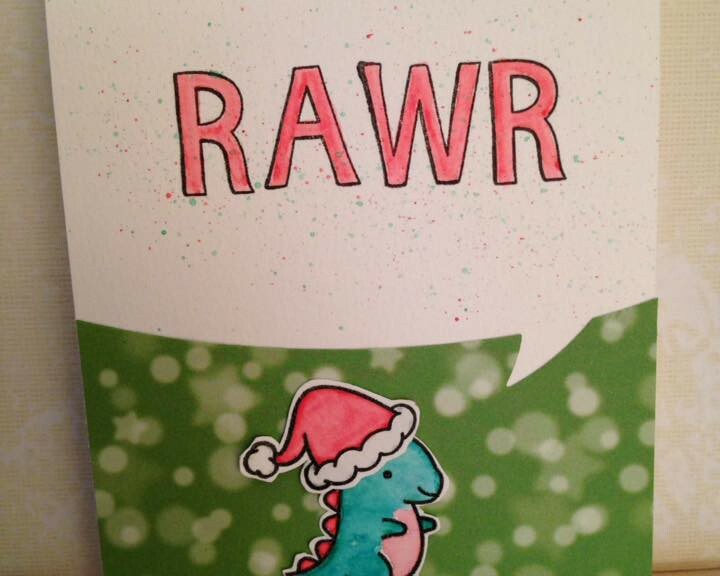 I used Lawn Fawn’s Rawr and One in a Chameleon sets. 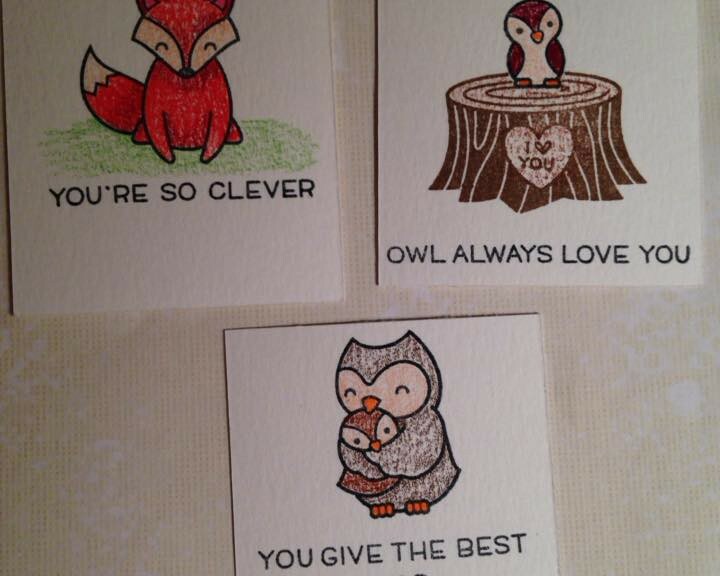 Extra Details: I stamped the images on each card. I used colored pencils to color everything in. Hope you enjoyed the cards! This is the latest batch of Lunch Box Notes I created. I used Lawn Fawn’s Mom + Me set. I enjoy trying to use every set I own for lunch box notes for my kids. Cards, Quilts, Desserts and More!